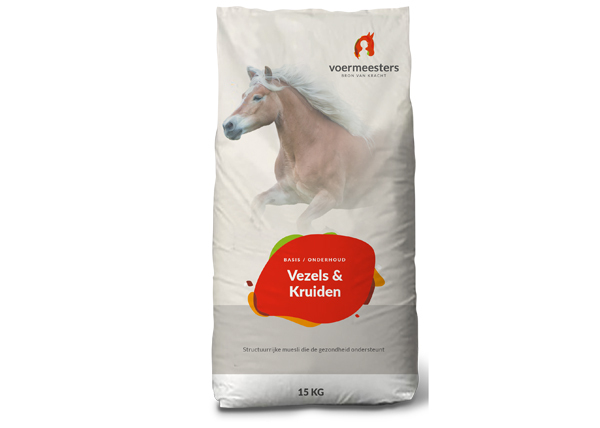 Voermeesters Vezels en Kruiden (Fibers & Herbs) is a structure rich muesli with a high proportion of timothy and herbs, with a higher dosage of vitamins, minerals and trace elements. Timothy is a fiber-rich grass with a low sugar content. This makes this muesli very suitable for all horses and ponies. The addition of herbs supports, among other things, the airways, the digestive system and the immune system. The muesli is available in 15 kg. bags. Benefits: – Low starch and sugar content., – Supports immune system., – Supports digestion., – Natural ingredients., – Balanced nutrition., – Pure feed.